There’s a reason why NCAA College Football Fans show up early to the Pasadena Rose Bowl game. It’s not getting the best parking spaces. 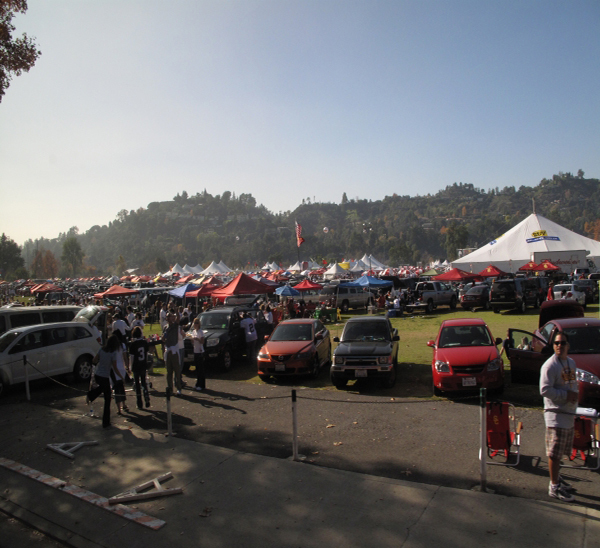 Rose Bowl tailgating parties are an essential part of the game day ritual. Tailgating gives both teams fans the opportunity to socialize, eat, energize before they head into the Rose Bowl stadium to watch their team play in the Granddaddy of them all. Over 100,000 fans will descend to the Pasadena Rose Bowl, this means much traffic both to and from the Stadium. We recommend getting to the stadium as early as possible to avoid traffic delays. Arriving early will give you more time to tailgate as well. 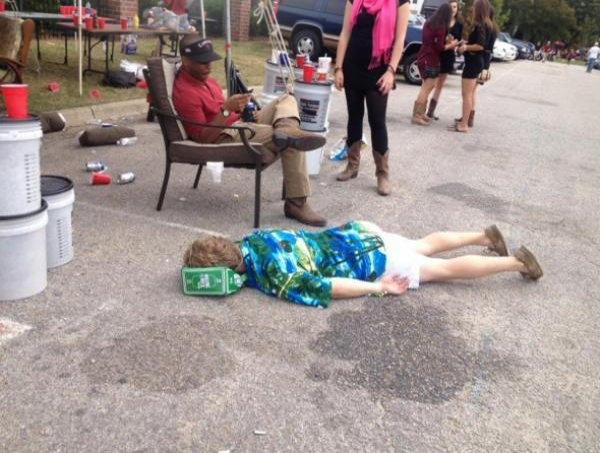 Rose Bowl Tailgating 101 Know your Alcohol limit! Know your alcohol limit! In Pasadena, Public intoxication and alcohol-impaired behavior at the Rose Bowl is dealt with aggressively by Pasadena law enforcement. Need Assistance? Tailgating Ambassadors at the Rose Bowl continuously patrol the lots to provide fans with information and assistance if needed. The ambassadors at the stadium are on bicycles and dressed in green uniforms. Overnight parking at the stadium is prohibited. Parking at the Rose Bowl is first come-first served, and the is no saving of stadium parking spaces is permitted. General parking Rose Parking lots, including the golf course, Area H, ball diamonds, as well West Drive RV parking may open at different times on the game depending on the event. If you need Public parking passes or RV parking, you can check out ParkJockey. When entering the Rose Bowl Stadium parking lot, it is essential to follow directions from stadium parking personnel. If you are bringing a tent, it must be no larger than larger than 10’x10. Although your tent should be a bit bigger than this. 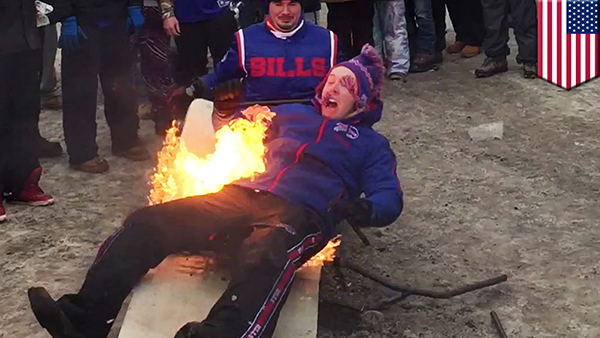 Open flames are not permitted in any Rose Bowl tailgate or parking area. Charcoal grills are not allowed in the stadium’s RV parking area which is at West Drive. All barbecue grills at the Rose Bowl must be raised off the ground. 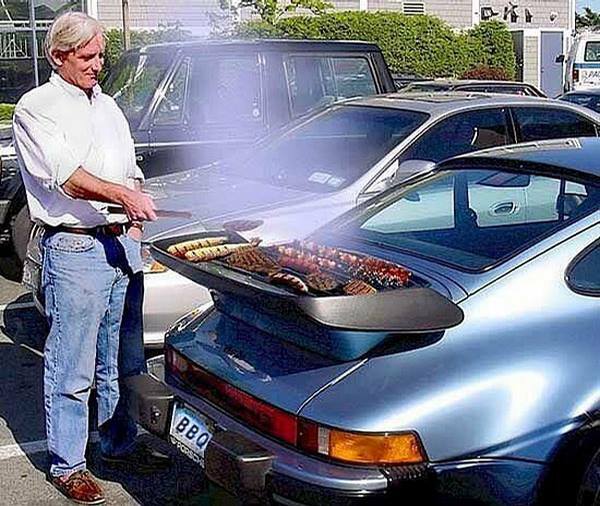 Charcoal grills are allowed in most tailgate areas. Please dispose of charcoal properly after use. All drinks in the Rose Bowl tailgating area’s must be in plastic or disposable cups. Please do not bring glass when tailgating at the Rose Bowl. Please do your best to clean up your Rose Bowl tailgating area before entering the big game. Bring trash bags with you to the Stadium to dispose of trash. Schedule of 2019 Rose Bowl Events. 4:00 a.m. Stadium Parking Lots Open. 7:00 a.m. Merchandise Booths Open. 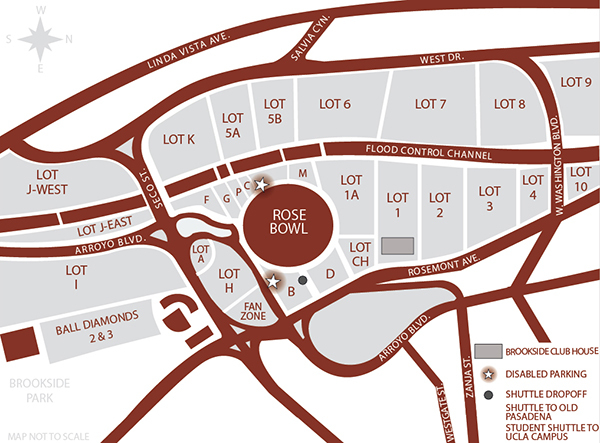 8:00 a.m. Public Rose Bowl Tailgate Opens in Lot 1A (5 min walk from Stadium. 10:00 a.m. Ticketmaster Rose Bowl Game Will Call Opens (Gate B). 10:00 a.m. Shuttle to the stadium from Parsons Begins. 11:00 a.m. Universities Will Call Opens (Rose Bowl Stadium Gate A). 11:30 p.m. Rose Bowl Gates Open. 1:00 p.m. Public Tailgating lots Close. 1:00 p.m. 2019 Rose Bowl Pre-Game Activities Begin. 2:00 p.m. The 2019 Rose Bowl Game begins. The Primesport Hospitality party is in Lot H of the Official Rose Bowl Hospitality Village. The club offers unlimited wine, soda & beer. There is an enormous Bloody Mary bar as well as BBQ Rose Bowl tailgate lunch. Official Pasadena Rose Bowl Hospitality Village is 10 a.m. – 1 p.m. The village opens again after the Rose Bowl for fans to skip the post-game traffic, eat and drink while watching the Pasadena Rose Bowl live. Tickets are $175.00 per person, click here for more information. Check out our where to sit at the Rose Bowl for a breakdown of the good and bad seat locations. You can also purchase Rose Bowl Tickets. 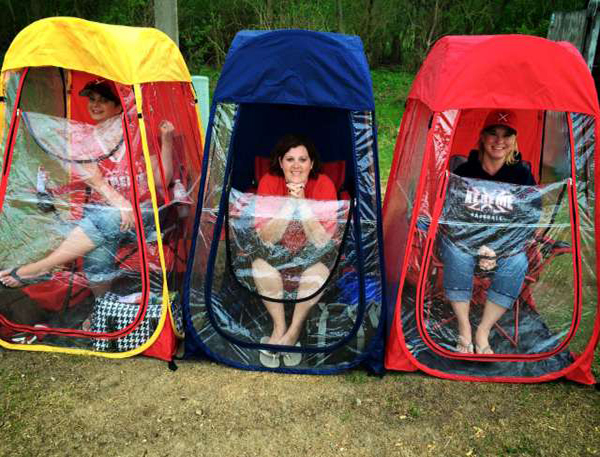 Are you aware of any other tailgate party options other than the $175 option. We are a family of 4 including 2 teenagers, so $175 each for kids not drinking is a bit much to spend. Thanks for any help and guidance. We are Georgia fans…so if you hear of other organized options to buy into for our situation please let me know! Thanks! Hi Julie, the options listed for the Rose Bowl tailgate parties are the face value prices. If we hear of any other ones we will email you right away. Hello! This is great information. Thank you. I purchased a parking pass in lot H for the Rose Bowl game. I’m told we are guaranteed that lot (price was $60) but spaces are first come first serve. Is that your understanding? Hi Dan, yes parking is first come first served. We recommend you get there as early as possible just because it should be a huge traffic jam all the way around the Rose Bowl. Who are you cheering for? Hi there! Thanks for the great info! Do you know if there are food truck options while tailgating? Is there a way to pre-buy a ticket for parking or can you tailgate in all the lots and just arrive early that morning and be sure spots are available? We are driving down from Seattle with all our tailgate gear and want to make sure we have a spot. Kind of sounds like we can, I just want to double check as it’s a long way to come and not get to tailgate before the game. Thank you! Hi Stacie, you can check out https://www.rosebowlstadium.com/visitor-center/parking-information-1, you purchase tailgate and parking for the Rose Bowl game there. Hi Chris, We are driving in (two cars) from about 5 miles west of the stadium. How early do you think we need to arrive? Is it better to wait for the Parade traffic to die down (since the parade starts at 8, I was thinking of leaving the hotel at 8:30). Thanks for the guide! Hi David, Yes. There are certain parking lots for each team.. but I think the teams gravitate to whichever parking lots. If they are alumni or of that nature, it is best that they contact the person in charge of their tickets to find out which lot. Maybe even since it’s Monday the Rose Bowl committee can tell you or it will be online.